A sunny spot that is convenient for quick picking. Make a late spring planting of seedlings started indoors or purchased. 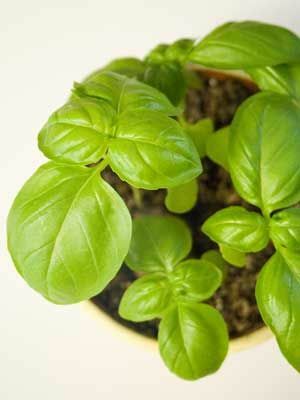 In summer, after the soil is warm, sow more basil wherever you want it to grow. Cover transplants with flowerpots to shade them from strong sun for 2 days or so. To keep new leafy branches coming on, pinch off the upright flower spikes as they appear. Harvest leaves a few at a time as you need them in the kitchen. In midsummer, cut plants back by half to stimulate new growth, and make big batches of pesto with the trimmings. Plants that slowly wilt to death and show a dark ring on their stems near the soil line are infected with fusarium wilt.